DS 3578 Series - Superior performance! The DS3578 Series of rugged, cordless, omni-directional 1D/2D imager scanners bring comprehensive, high-performance data capture to harsh industrial environments. Engineered with breakthrough digital imaging technology, this scanner family delivers extremely fast and accurate data capture of 1D/2D bar codes, direct part marks (DPM) and images, and supports Item Unique Identification (IUID). 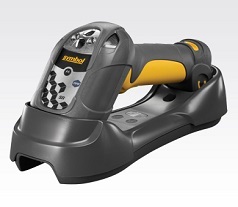 Integrated Bluetooth provides cordless freedom, improving productivity. Cable-free convenience. Secure wireless transmissions. Reduces repairs due to cable failure.